How much stock should we put in the CIS-NCAA exhibition games? As the 2014 summer comes to a close, the CIS vs. NCAA exhibition series is wrapping up. Courtesy of Martin Timmerman's cishoops.ca, the NCAA took the lion's share of the men's results, winning 19 of a possible 27 games. There are still a handful more to be played against RSEQ teams and York. In 2011, 20 CIS teams combined to play in 61 exhibition games against a variety of NCAA division teams. NCAA teams won 51 of those games, a .830 win percentage. Carleton was responsible for five of Canada's ten wins. 2012, 22 teams from the CIS played 57 games against NCAA competition. Again, the NCAA won the summer handily, taking 46-11 games (or, an .807 win percentage). The upwards trend continued in 2013. There were less games against NCAA competition -- only 37 games between CIS and NCAA DI/II/III schools -- but the Canadian universities won a similar amount of games. The NCAA won 27 games and lost ten, a .729 win percentage. One of those wins was Carleton's over Wisconsin. So, things are trending upwards, which is neat. And I don't really how much more it is than "neat." How much can we really learn from these games and are positive results -- meaning wins and close games -- against NCAA programs indicators for success during the CIS regular season. I will dive in to the numbers, but let's get some contextual issues out of the way first. Before NCAA programs come up here, they are afforded 10 practices in advance of the games per the NCAA's (draconian) rules. Canadian teams do not have those restrictions, and I've even heard some coaches jokingly say that it is an "11-and-a-half-month season" for elite CIS basketball programs. So, on one hand, you've got one team with athletes that are allowed to play for five years and practice year-round. On the other, you have a team where athletes play for four years at most, and your best NCAA teams will lose players who opt to play professionally. (I understand that this happens in the CIS -- hello, Terry Thomas, Showron Glover, etc. - but not on the same level as NCAA). And consider the rules difference between the NCAA and CIS. This is rudimentary for long-time CIS fans, but still worth rehashing. There are eight states in the U.S.A. that use some form of a shot clock. The NCAA uses a 35-second shot clock, and unless an American athlete has played with an international program, it is entirely possible that players are encountering their first ever 24-second shot clock situation. 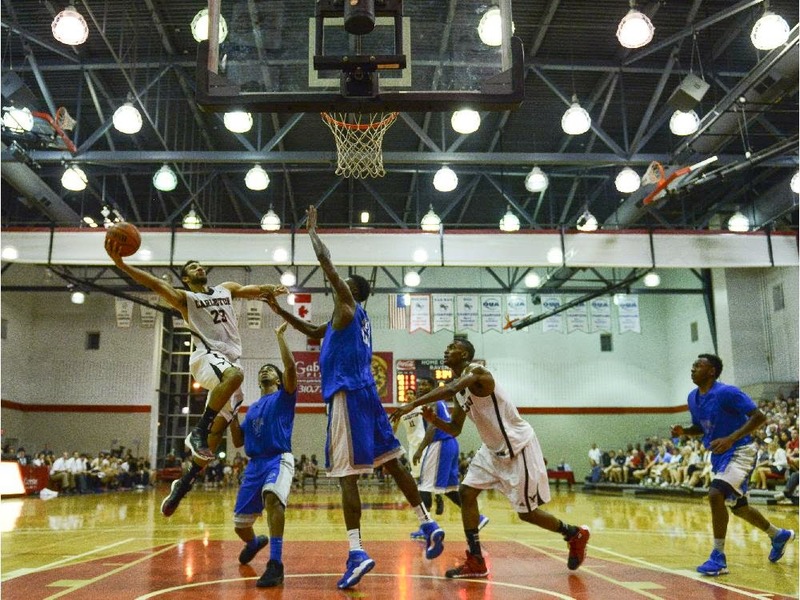 The CIS plays under FIBA rules, which allows a more physical style of play. 6-foot-9, 300-pound Steve Forbes from IPFW was impressed with McMaster's physicality after an exhibition win earlier in August. Forbes is not alone in that feeling, as other teams have echoed the sentiments in previous years. This is a little more nuanced and hard to show without video or graphic evidence, but NCAA teams do not have the same time to prepare for CIS teams. There simply is not a lot of time to create game plans for the teams they are playing and these Americans play a lot of squads in a short period of time. “[Ottawa and Carleton] are both really well coached but I thought Carleton was just a little bit better defensively,” said Catamounts coach John Becker. “(The Ravens) run at the ball and get a lot of strong-side help, and they’re a little bit bigger, but they’re both similar. Carleton wants to force a team to the weak side, and that defence can trick players into making passes which are just not there. What separates Carleton from the rest is their personnel. Players like the Scrubb brothers and Jean Emmanuel Pierre-Charles (among countless others through the years) are so quick and long, they disrupt passes that most players could not get in the same scheme. Even when CIS teams have comparatively endless amounts of time to prepare for Carleton's defence, they still struggle. An NCAA team, under new rules, in a brand-new environment, playing in their first real games together, is going to struggle too. So, we've established that there are some unique factors at play when these programs face off. But still, what does a positive result against an NCAA program mean fans can expect from their team in the following season? The charts below shed a little light. So, six of the 12 teams (I'm treating every season as a different team) that won an exhibition game against an NCAA team qualified for the Final 8. Only one of those six teams did not medal. There are a ton of layers to these numbers. Teams like The Citadel University Bulldogs went 7-26 in their season but still count as an NCAA "win." And people treat them that way. If a team beats an NCAA team, my reaction is "well, great, but who did they play?" That is a compliment to the competitiveness of the league, by the way. If who you are beating matters, it means you're competitive with those teams, or at least approaching the status. As far as the games being an indicator of future success in the CIS season, I think the sample size is a bit too small. But I am comfortable with saying it does not tell us much, as we get From these numbers, a 50 per cent chance does not illicit any confidence for the future of the team. One game probably would not sway my opinion of a team one way or the other, but it does matter in terms of public discourse and possibly CIS Top Ten rankings, which have an impact on the wild card spot for the Final 8. If we're going to put meaning into these games, which is dangerous, given the reasons I outlined above, it is that the NCAA and CIS are closer than the average fan gives them credit for. Whether that means they could compete in weaker conferences, well, I do not know. But now, more than ever, its a conversation worth having.